Posted on February 3, 2010 September 5, 2010 by John McHugh M.D. Elevated PSA? To biopsy or not to biopsy-that is the question. The rectal exam can be completely normal and you can have prostate cancer. The rectal exam can be completely abnormal and you don’t have cancer. The PSA can be elevated and you don’t have cancer. The PSA can be normal and you do have cancer. The PSA can be elevated and the rectal exam abnormal and you don’t have cancer. The free PSA can be high(indicating a low probability of cancer) and you have cancer. What’s a man to do? In my opinion, if the question has been raised(usually an elevated PSA, a dramatic change in a PSA, or a abnormal prostate exam), then you go ahead and do the biopsy and put it to rest. Other wise you will be re doing rectals and PSAs until you are blue in the face and in most cases do the biopsy anyway. By doing the biopsy and then hopefully getting good news that there is no cancer, then your exam or PSA becomes the baseline. You would not need to consider another biopsy unless something in your parameters change. It only takes a couple of patients that I have had who had normal prostate exams, minimally elevated PSA and the subsequent biopsy be full of high Gleason grade prostate cancer, for me to have assumed this mind set and opinion on a “low resistence” to recommending the biopsy. The decision to do a biopsy is tough, but in most cases has to be done, otherwise it is simply mental masturbation. Then if the biopsy is positive but with favorable parameters,(low Gleason’s, low volume) another tough situation. So the “decision” is tough. Here’s what you do. Take all of your who are you factors (issues specific to you and your family and health)and mesh that with the specifics of your disease(Gleason’s,PSA, volume of disease on your biopsy)and your perception of all the risks vs. benefits(best shot at cure, least likelihood of impotence and incontinence) and then run all that through your friends and doctors. Let some time pass and you will gravitate to a decision. And don’t forget that “doing nothing” or active surveillance is an option particularly if your biopsy parameters are favorable (do you know what means?) and if your age and health make that option reasonable. 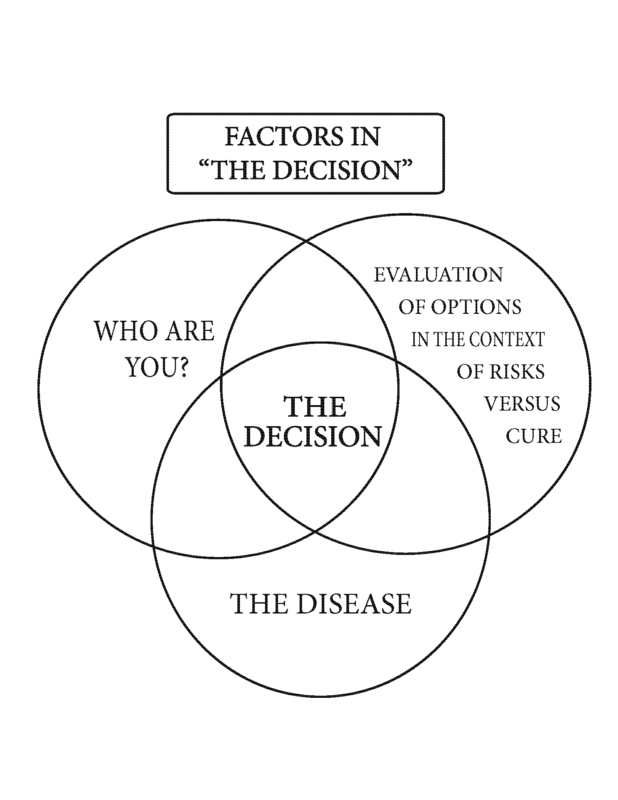 The links below are from the “the Decision”- theprostatedecision.com and offer a way to summarize what you know and how you feel to help you get to a decision. If you viewed the worksheet or cheat sheet and it helped or if you have comments please add as an opionon. The concept of using a worksheet is new and to my knowledge nothing else like it exists in the literature. Print it out and give to a friend who is in the “decision” process.